Foster City’s Hillbarn Theatre’s production of this quirky musical, with Andrew Lippa’s music and Tom Greenwald’s lyrics, is surely a solid piece. South Bay director Jay Manley, known for his penchant for large cast musicals, takes a different turn here. This piece is all about tone and spacing, tight movements and sharp harmonies, as well as a compelling storyline that deals with moving on in life when maybe that doesn’t feel quite right. The story spans 38 years, beginning when Jen (Alicia Teeter) first meets her brother when she is six-year-old. He smells odd, but she knows she is responsible for protecting him. The protection comes in the form of shielding John (William Giammona) from an abusive father, one who bruises John’s face for breaking a glass. Still, John’s loyalty to his father, which is not uncommon for an abused child, is maddening to Jen, who is struggling to shield her brother from anything regarding their dad, including a fight dad has with their mother that ruins an ideal little boy’s Christmas. Manley’s direction takes place on an intriguing set designed by Robert Broadfoot. The set is heavy on bold colors and sharp lines that accentuate Manley’s effective staging, creating separate locations which contribute to consistent flow throughout Hillbarn’s unique studio space. A nice touch is how silhouettes of such happy memories hover in the ether, creating a sharply ironic touch. What works well is how both Teeter’s and Giammona’s voices work in splendid harmony. Teeter’s voice is loaded with sharpness and range, featuring many brights and a gentle timbre. Giammona provides an uncanny knack for harmonies, extremely effective in the number “Talk Show,” when he played Jen’s son in Act II, where a few fugues were handled by both with very sharp skill. The many numbers, with minimal spoken dialogue, ranged from simple and banal to fun and poignant. Music director Graham Sobelman and his three-piece band could barely come up for air as the show continued to move. “Hold Down the Fort” is a pleasant number, the audience’s first experience at seeing the inseparable siblings finally separate. “Baseball,” a number that hits close to home when it comes to embarrassing moments watching your child play a youth sport, is effective in its tongue-in-cheek joy. And “Smile of Your Dreams” serves as important internal exposition, a lovely aria for Teeter. Yet, for all the good things this plucky show does, where it is least effective is in its emotional demands. The connections between the two didn’t always feel organic, and there were certainly moments where the story absolutely must go further and deeper. The show seems to be missing more of an emotional punch, something that can either be sharpened in the writing or in the storytelling. In moments where I probably should have felt, I didn’t always feel. “John and Jen” is an inherently American story. And the lasting impact of the show is simple – early connections last for a lifetime. And love between those who are bonded by both tragedy and joy is love that doesn’t go away, and certainly never will, in life or in death. 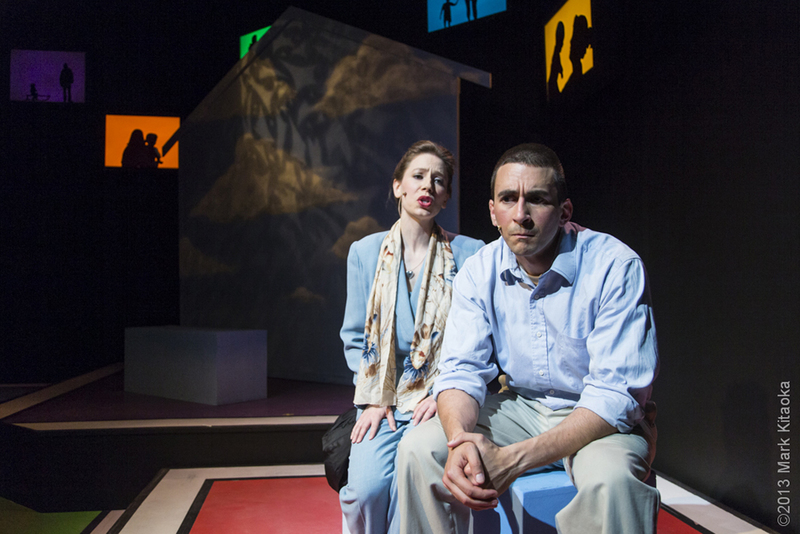 The word: Despite its flaws, “John and Jen” tells a compelling story. Call 650-349-6411 or visit hillbarntheatre.org.